It’s a funny old day today. At the crack of dawn (well, 8.30) Mr A and I bid a temporary adieu to Miss R as she set off with some of her classmates on their Duke of Edinburgh Bronze walk. As a nearly 15-year old she has of course been away from home. But she’s never been dropped off in the middle of nowhere armed only with basic provisions of NASA-type food, compass and water. No adults, no personal phones, no GPS. That’s what I can’t get out of my head – they are literally alone, with nothing but an emergency phone in a sealed envelope to connect them to the world, 15 miles away. Prior to departure they were all leaping about the car park in giddy anticipation of their 18 hour pass away from parental controls. But us parents, despite our smiling facades and cheerful waves, were probably all distracted basket cases, a packed weekend planned to stop us wondering how they are getting on, and if what’s her name remembered the matches. Or maybe that is just me. Mr A is fine about it as he did DoE in his day – achieving his Gold award, which culminates in more of the same but for a longer, blister-inducing time. The most intrepid thing I have done on my own was go to the Soviet Union when I was 20. I think my parents thought I was in Greece. Because I am me and rather known for coming a cropper when away from home, I ended up ill in hospital, with US embassy staff bringing me toilet paper and contraband trashy magazines. That must be what is guiding my thoughts, that Miss R may have inherited my gene for not-quite disasters. Must get a grip and realise that she is her father’s daughter, a capable leader-type with a calm head and a brave heart. She’ll be absolutely fine. No doubt really. But, can she make s’mores like her old American mum, probably not. Hang in there, dear reader: a totally unrelated recipe follows the page break, after a bit more musing – about blood pressure. After getting back from the drop-off Mr A and I not so randomly decided to excavate the blood pressure machine and test ourselves. Being slightly ostrich-ish about these things we haven’t taken our bp in years. Worse still, as a nurse and health educator respectively, you’d think we’d be on top of such things, but no. Family history of high blood pressure on both sides has perhaps guided our approach to health generally, but not its monitoring. Anyway, the previous day a friend had a wake-up call when he tested his blood pressure. He rocked up to the doctor who remeasured it in his scary white coat (for which you can take off a few bp points) and declared that said friend was a ‘lifestyle timebomb’. So, although not ourselves being in the interesting but dangerous timebomb category, Mr A thought it was high time to dust off the machine and face the truth. Luckily for us the readings were very good, better than I was expecting for myself (Mr A is disgustingly fit). But with our family history it may not always remain so smugly low. We won’t be waiting years to remeasure. If you haven’t measured yours in a while, get to the doctor or chemist and just bite the bullet. You’ll be glad you did, even if you find you need to make some changes, or pop some pills. While I’m on a roll, I might even book a cholesterol test. Woo hoo, exciting life! Today’s recipe fits nicely with anyone looking after their heart and all other body parts for that matter (I may be exaggerating slightly). It’s a loose reworking of one a friend found on a website and made as part of a lovely meal. I love, love, love middle eastern food; it’s got to be some of the healthiest on the planet – vegetable-heavy, meat-light, quality oils, fragrant herbs and exciting spices. I am also overly fond of Japanese food but I would happily eat in any of Yotam Ottolenghi’s ‘med-east’ cafes everyday if I could afford it – or afford London. This recipe majors on onions, garlic and aubergines and is truly delicious, if about as subtle as a cricket/baseball bat. What really takes it to another level is the dressing, again not for the shy and retiring – and definitely not date food. If you can deal with the strong flavours, I guarantee you will love this dish. To cope with the dominating alliums I have included perhaps the most middle-eastern of spice mixes, za’atar. Like many foods and recipes that are used across a region za’atar has numerous interpretations. At its most basic it will be air-dried wild marjoram, perhaps thyme, and always toasted sesame seeds and salt. Palestinians add in caraway, while the Lebanese use the deep red, lemony sumac. Za’atar also refers to the wild marjoram itself. You can make an eat-now blend by using fresh rather than dried herbs, but the intensity that drying brings to herbs serves its purpose well in this recipe. Nutrition Notes: Nutritionally it is a case of where do you start? The alliums are undoubtedly the heavyweights here, but the tahini (sesame seed paste) too is a serious contender. As is the white-fleshed, purple-robed aubergine. Garlic, which I discussed recently as wild garlic, is probably the world’s most widely used – and oldest – ‘condiment’ plant, being essential in nearly all culinary traditions. Both onions and garlic are exceedingly rich in cancer-preventing, heart-protecting sulfur compounds. Garlic especially is loaded with potent (in more ways than one) alliin, waiting to be crushed, chewed or bashed to transform into the unstable supercompound, allicin – responsible for protection and the distinctive smell and sting. Some people want garlic’s benefits without its social implications, but a US study has shown that garlic capsules lack the essential element: allicin only hangs around for a short time before denaturing. To get the most from garlic, crush or chop garlic and allow it to sit for 10 minutes before adding into a dish that will be eaten immediately. Cooking will still give you plenty of allicin, and will bring about still other protective compounds, including one that – at least in the lab – neutralises an extremely dangerous compound created by tobacco smoke. So, have garlic both cooked and raw to get the full benefits. The compounds in onions work in a similar fashion but instead of the taste getting stronger onions release a transformed molecule that irritates our eyes. Try using ski or swim googles to reduce the ‘tear factor’. Remove before answering the door, however. I learned that one the hard way. When looking at the cancer literature it seems fairly indisputable that all members of the allium family – garlic, onions, shallots, chives and their wild relatives – help prevent cancers of the digestive system, principally esophageal, stomach and colon cancers. This is probably at least partially because the compounds protect against highly carcinogenic nitrosamines. This cancer-causing compound is formed in the gut from ingested nitrites, a class of food additive found in cured meats and pickled foods. The cancer-fighting compounds help prevent the formation of DNA-mutating nitrosamines, reducing the risk of cancer developing. Newer research also shows some protection from prostate and breast cancers too, although the associations are not as strong as that for digestive cancers. Regardless, population studies of food habits consistently show that the more alliums we eat, the more protection we get from cancers generally: a large Shanghai study found that individuals who ate around 10 grams of allium vegetables a day had half as many cancers overall as those who ate less than two grams a day. Studies in the US, the Netherlands and France show similar findings. We also know that Western countries fall far short of protective ‘dose’ of 6 grams of garlic per day. This recipe will have you well on your way to fulfilling the suggested dosage. This is a reworking of a recipe from 101healthyeasyfoodrecipes.com. My friend Niki had made it and our family fell for it in a big way. Despite me churning out new dishes nearly everyday the family have been gently asking me to make ‘Niki’s aubergine thingy’. So we did it as written and were very happy with our garlic-breath fumes. Which is a thought: delicious as it is the original recipe is not for the faint of heart as it has a lot of onions and raw garlic, and quite a bit more tahini too. So I’ve mellowed it a tad in the allium department, lessened the tahini and added in yogurt. I tweaked the flavourings further by introducing one of my favourite Middle Eastern spice mixes – za’atar, the recipe for which is below. We had this non-salady salad with a balsamic-dressed plate of mild green leaves, and some amazingly tender and flavoursome single lamb chops from Scotland’s only organic butchery counter – Hugh Grierson at Earthy Market. If you aren’t a committed vegetarian I highly recommend lamb chops, but grilled fish or a tomato and bean salad plus pita breads would make it a meal. I oiled the chops and rubbed in za’atar and extra sumac before cooking on a ridged griddle pan. The chops look quite dark but that’s the sumac, I promise! Pop the aubergine slices into a colander and sprinkle generously with ordinary table salt. Leave in the sink or on a plate and allow the aubergines to ‘degorge’ (release their water) for up about one hour. Rinse well and pat dry with kitchen paper (I actually put them in a tea towel and whirl them around outside, allowing centrifugal force to dry them!). This step is crucial to stop the aubergines absorbing too much oil and makes them especially tender. Don’t skip this stage! 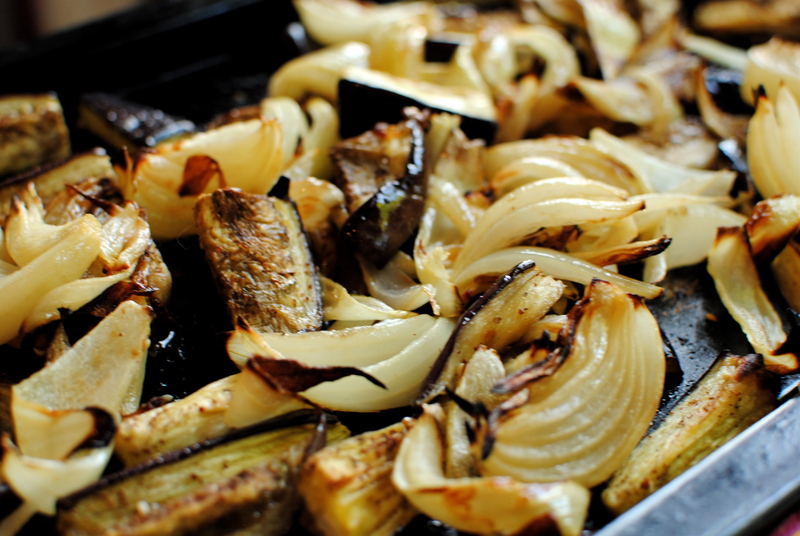 Toss the onions and aubergines separately in equal amounts of olive oil, place on 2 baking trays and bake in the oven for 20 minutes and 25 minutes, respectively. You are aiming for tender, slightly tinged onions and soft, patchily coloured aubergines so adjust the time if your oven is hotter or cooler. Put the vegetables into a large bowl and toss in the za’atar or sumac and oregano. For the dressing, crush the garlic with a pinch of salt in a pestle and mortar or in a mini food chopper. Gradually blend in the tahini, followed by the remaining ingredients. Taste it and decide if you want to add salt and pepper, and maybe a touch of honey. 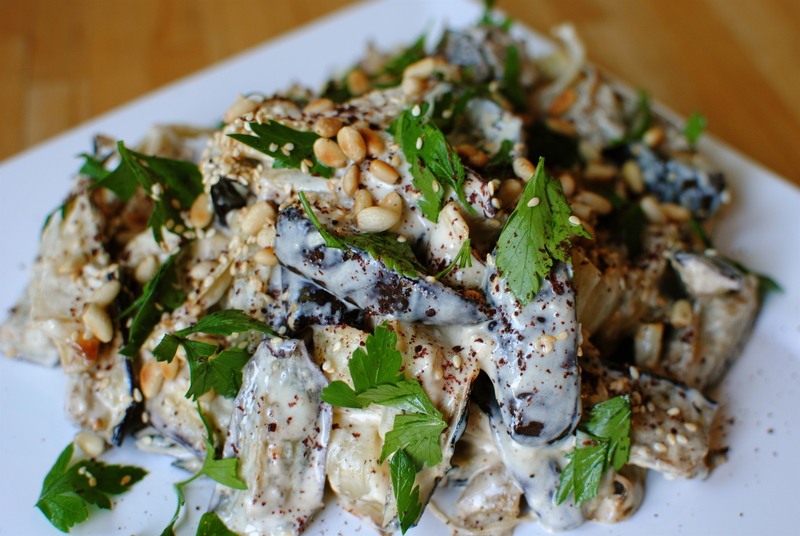 To assemble, lightly fold together the vegetables and tahini mix; decant onto a platter or to a wide serving bowl. Sprinkle over the chopped parsley, lemon balm or lovage (if using), and the seeds. Flourish with a touch more za’atar or sumac and serve at room temperature. Do not serve chilled. Za’atar: 2 tbsp dried thyme, 2 tbsp toasted sesame seeds, 1 tbsp ground sumac, 1 tbsp each dried oregano and marjoram, 1 tsp sea salt. Whiz briefly in a spice grinder or clean coffee mill. Store in a jar away from moisture and light. Use to top hummus, as a meat, fish, vegetable or chicken rub with a little oil (as I did), to flavour labneh (a Lebanese ‘instant’ cheese made from strained yogurt), bread dough, dressings/marinades. 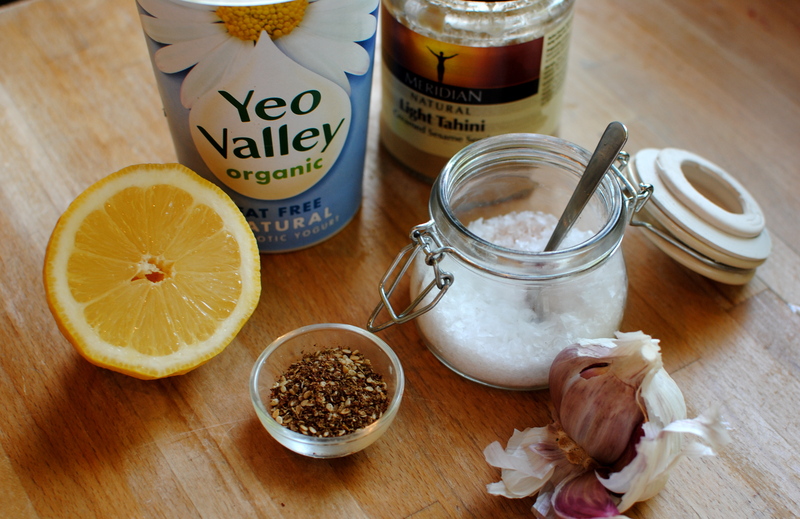 Or, perhaps use some as a dry dip for oil-dunked fresh or toasted breads – a simple but hugely flavoursome nibble. More calories needed? Use more olive oil for roasting and more tahini too. Extra seeds would be good too. I’ve at last found a way to get the recipe and comment . It has been frustrating not to be able to have my tuppenceworth! As grandma A-I well remember the feeling of abandonment when leaving Mr A on his first DOE expedition but somehow it was different for boys-they were supposed to love the prospect of a night in the great outdoors without any adult telling them what (or not) to do! I like the look of this recipe and will go to Lidl tomorrow for brinjil, egg plant or if you prefer aubergines. I know you know how I’m feeling! Tonight is a trashy peanut butter and chocolate ‘day-ahead’ birthday cake. A few more calories than this?! 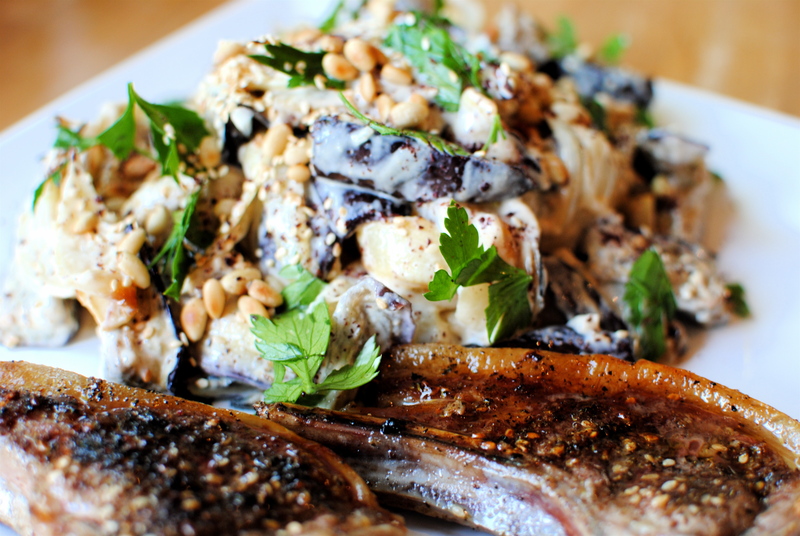 Hope you like the aubergine/brinjal/eggplant salad. 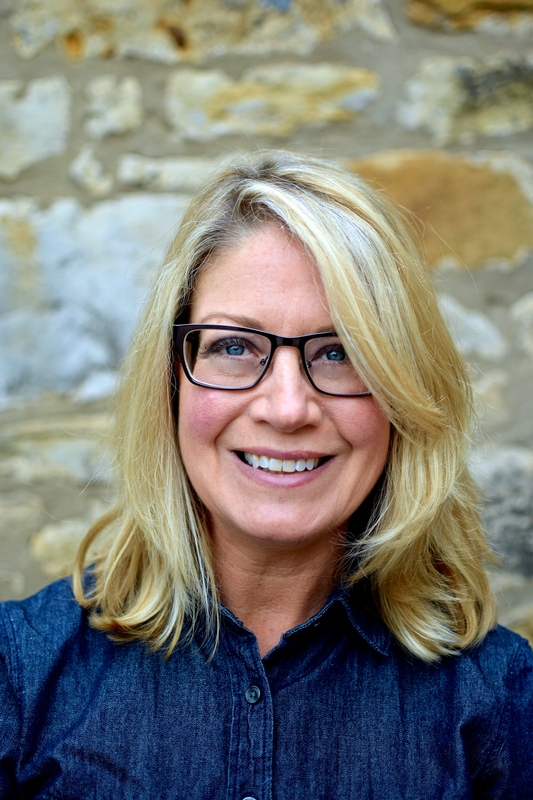 Hi Kellie, great post! Loved reading it. I’ve got 2 step kids, a 9yo boy and an almost 8yo girl – I love them to bits and know that I would be feeling exactly the same way you were… Hope your daughter did great! Love the idea of the salad, eggplant is one of my favourite foods and the whole Middle Eastern angle to it sounds irresistibly good! Thanks for sharing! Thanks Martyna. She’s away again on Geography trip but I’m cool with it. The eggplant salad is really lovely and evocative of exotic hoilidays.Not too late to try it out, methinks. Thanks for stopping by. I’m bursting! I use swim googles! In fact, I have a pair in my kitchen drawer specially for cooking!